I recently received a new tool--a Lie-Nielsen tongue and groove plane. I was moving things around in the toolbox to see where the new tool could live. In the process I realized I have a box problem. I have a number of Lie-Nielsen boxes that I can't seem to part with. Pictured above are boxes spanning literally years. The small box at the top right is a chisel box and is about 3 years old. The chisel sits in the rack of my first Dutch tool chest, but the box now houses my small files. The middle box holds a router plane. The tool and cardboard box go into the Dutch tool chest. On the left is the new tongue and groove plane; still looking for a home. I haven't even had a chance to use the T&G plane--it's killing me. There are also a couple more chisel boxes laying around. 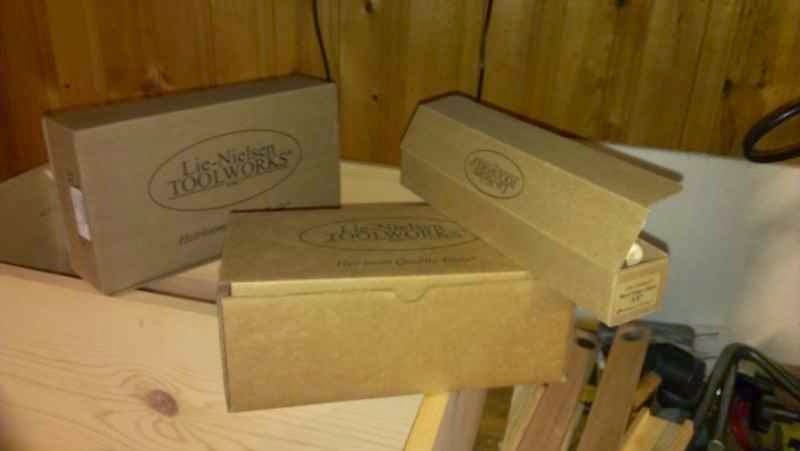 Lie-Nielsen is by far a minority of my tool collection, yet I have all these silly boxes. I think it is time to part with ages old cardboard. Boxes for sale! Get your small cardboard boxes here. Get 'em while their hot, people!